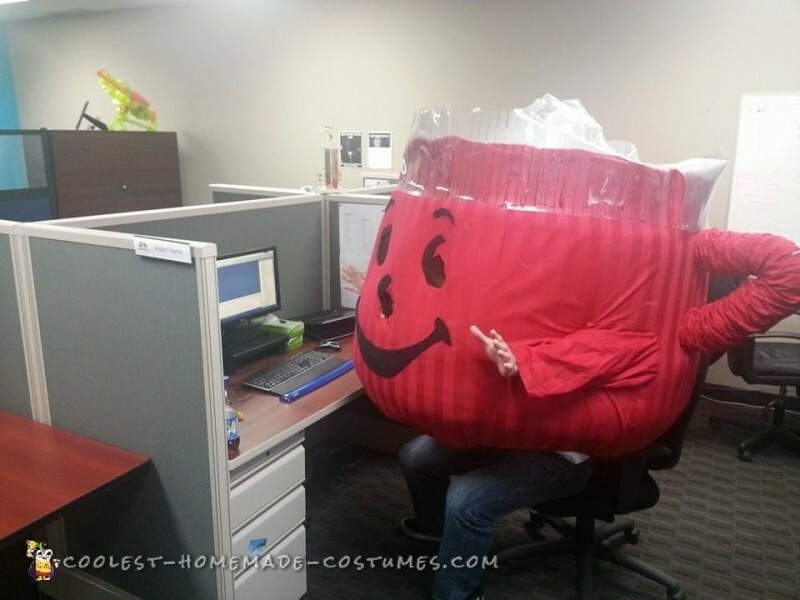 Well it all began when i stumbled across a video of Kool Aid Man (KAM) running down the beach against a bottle of cola. Cola tripped and the victorious KAM basked in his glory as he won the race. 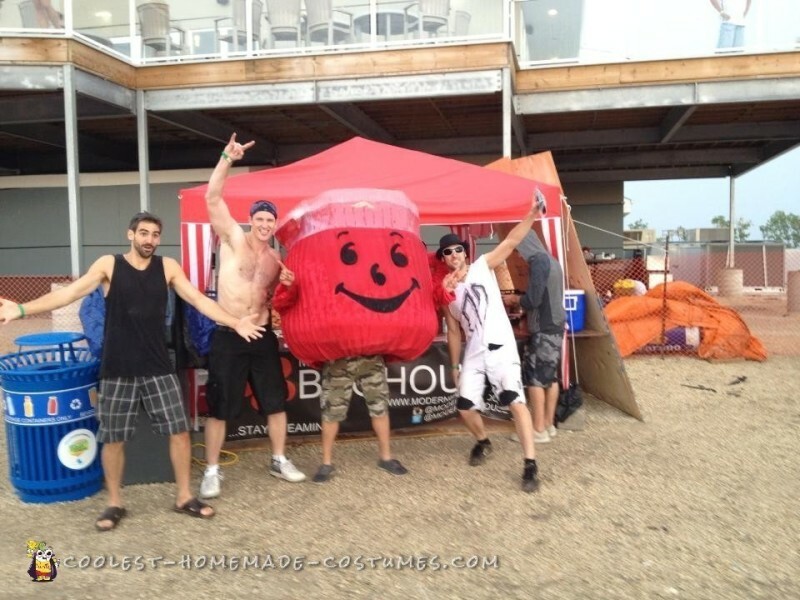 I had a beach festival coming up in the next couple of weeks and I thought who better to crash the party than the glorious Kool Aid Man. So I went to home depot that day and got some materials to start his creation. An extra large cardboard box, duct tape, some hula hoops and string. I spent a couple of days creating the basic body and shape. My mom helped with the creation of the outer body and sewing the duvet cover to give him the red color. I have to mention how we managed to luck out with the most important materials. I didn’t know what to use to cover the outside and really didn’t want to spend a lot of money. We found a king size red duvet cover from a bedding store on clearance for $60 down from $150! The last missing piece was to get foam to pad his body. I couldn’t find foam anywhere and the materials I did find were very expensive. My mom then remembered my dad used to have these bedding mats for sleepovers so she called him up and sure enough he still had these old bedding mats. We used those to shape the lower half of the jug and tied them with ropes. We finished cutting the material for the body, stitched it together and glued the rest. We filled up freezer ziploc bags with air and taped them with packing tape to look like ice cubes. We cut the eyes out and used paper towel cardboard rolls covered with pantyhose so that I could still see when i was wearing the costume. the final step was to make a support system so that the costume could be worn comfortably. My mom sewed custom padded shoulder straps and i built a cardboard support system inside of the costume. We tied them together and worked to fit it properly. In the end it took about 18 hours to make the costume. I wore the costume to 3 different events. The first was at the beach festival. 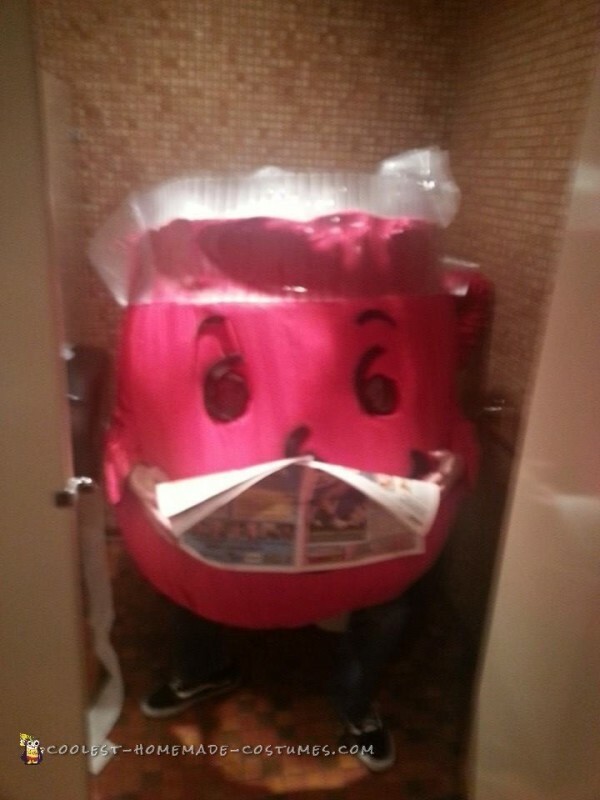 Everyone was drinking and then, out of no where, Kool Aid man shows up to have beer with everyone! DJs were playing music and KAM was getting high fives and having fun. No one else was wearing costumes but I didn’t care. Everyone still had a good time seeing KAM there. I had people coming up to me asking if they could wear it so I passed it off to a couple other people who had a ball dancing around in the costume. The picture I’m including is a guy who was running a shop at the festival and he wanted to try it on in front of his shop. The second event was my work halloween contest. Im a software developer and work in an office setting. 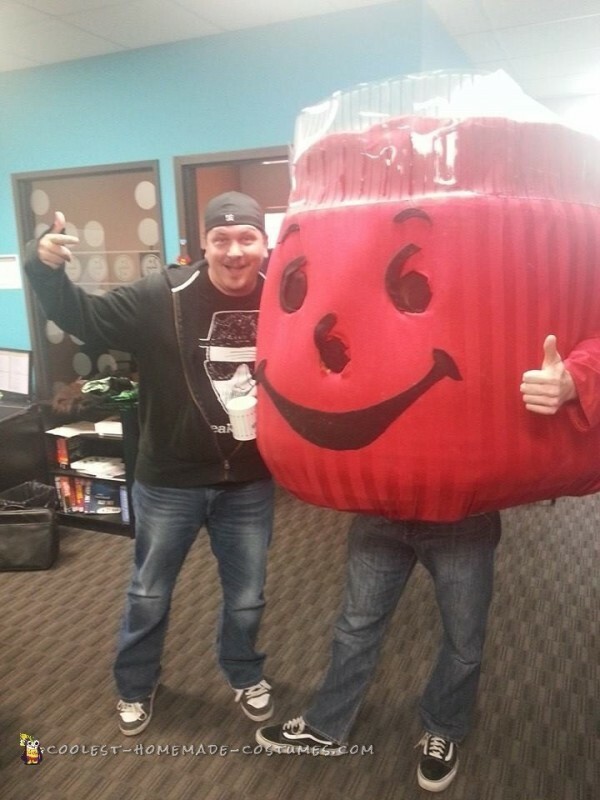 I wore the costume at work and got pictures all over the office. 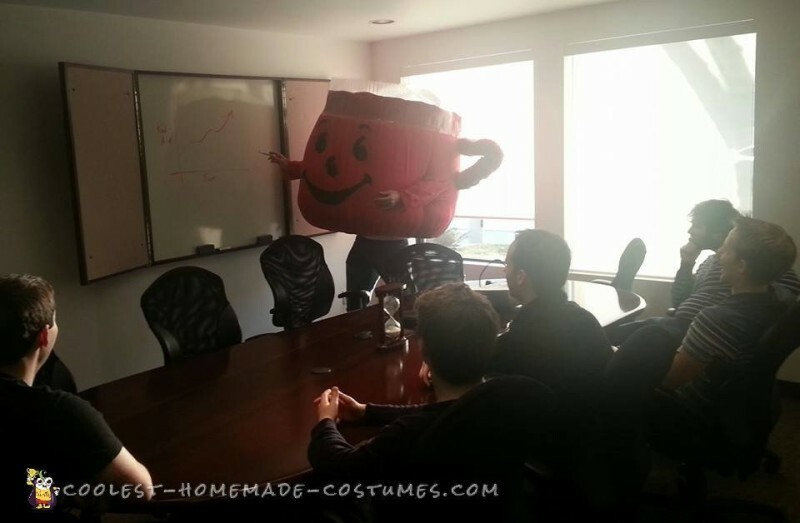 I even gave a presentation on how switching from coffee to Kool Aid would increase fun in the office. 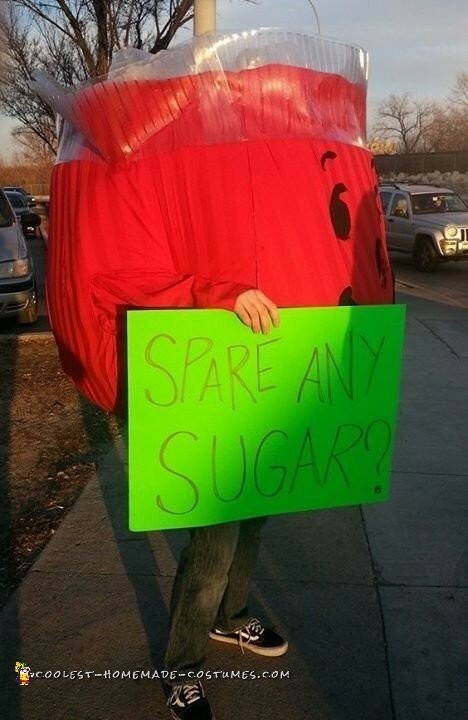 After work I took to the streets to beg for sugar on the corner outside of my work. We all thought it would be hilarious to see the KAM on the corner of the street so I did it. I didn’t end up getting any sugar but got some celebratory honks and smiles. 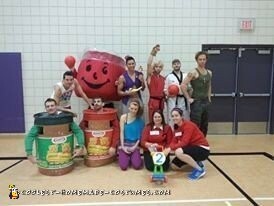 The last place I wore the costume was at a Halloween dodgeball tournament. Although it was difficult to play and i was an easy target, we still had a great time and I our team won best dressed team. I really enjoyed making this costume and wearing it to the events mentioned. 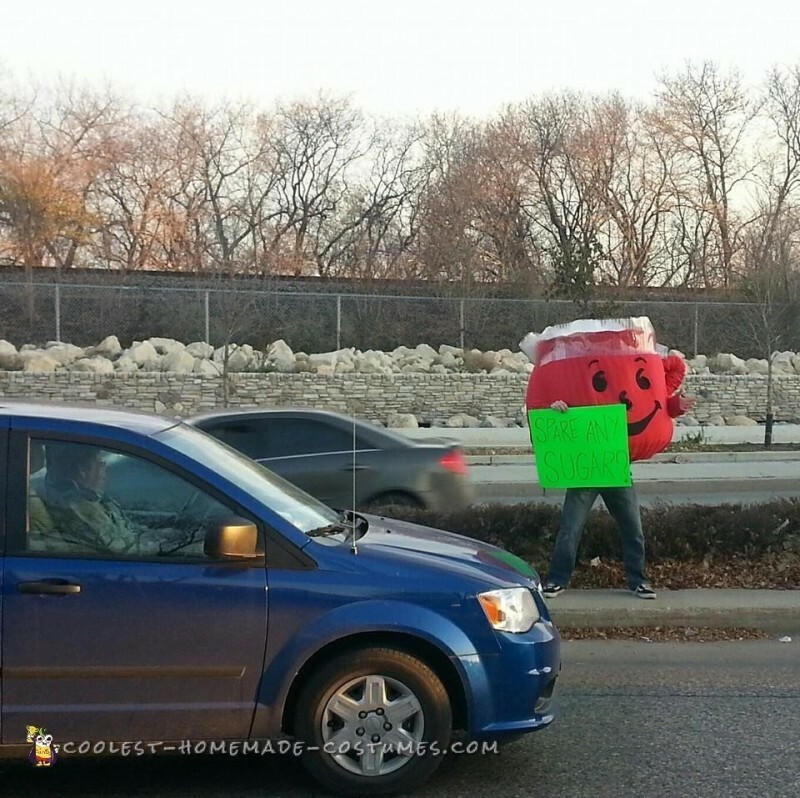 I hope that it inspired others to create their dream costume and think outside the box. Oh Yeah!